In geometry, a spherical cap, spherical dome, or spherical segment of one base is a portion of a sphere cut off by a plane. If the plane passes through the center of the sphere, so that the height of the cap is equal to the radius of the sphere, the spherical cap is called a hemisphere. For example, assuming the Earth is a sphere of radius 6371 km, the surface area of the arctic (north of the Arctic Circle, at latitude 66.56° as of August 2016) is 2π·6371²|sin 90° − sin 66.56°| = 21.04 million km², or 0.5·|sin 90° − sin 66.56°| = 4.125% of the total surface area of the Earth. This formula can also be used to demonstrate that half the surface area of the Earth lies between latitudes 30° South and 30° North in a spherical zone which encompasses all of the Tropics. 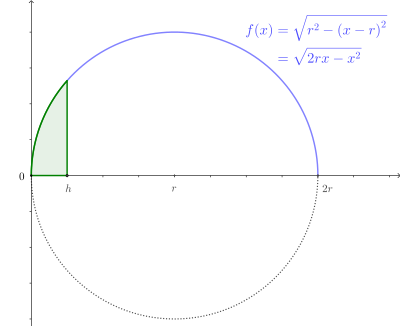 The spheroidal dome is obtained by sectioning off a portion of a spheroid so that the resulting dome is circularly symmetric (having an axis of rotation), and likewise the ellipsoidal dome is derived from the ellipsoid. is the integral of the standard normal distribution. ^ a b Polyanin, Andrei D; Manzhirov, Alexander V. (2006), Handbook of Mathematics for Engineers and Scientists, CRC Press, p. 69, ISBN 9781584885023 . ^ Shekhtman, Zor. "Unizor - Geometry3D - Spherical Sectors". YouTube. Zor Shekhtman. Retrieved 31 Dec 2018. ^ Connolly, Michael L. (1985). "Computation of molecular volume". J. Am. Chem. Soc. 107: 1118–1124. doi:10.1021/ja00291a006. ^ Pavani, R.; Ranghino, G. (1982). "A method to compute the volume of a molecule". Comput. Chem. 6: 133–135. doi:10.1016/0097-8485(82)80006-5. ^ Bondi, A. (1964). "Van der Waals volumes and radii". J. Phys. Chem. 68: 441–451. doi:10.1021/j100785a001. ^ Scott E. Donaldson, Stanley G. Siegel. "Successful Software Development". Retrieved 29 August 2016. ^ Li, S (2011). "Concise Formulas for the Area and Volume of a Hyperspherical Cap". Asian J. Math. Stat. 4 (1): 66–70. doi:10.3923/ajms.2011.66.70. ^ Chudnov, Alexander M. (1986). "On minimax signal generation and reception algorithms (rus.)". Problems of Information Transmission. 22 (4): 49–54. ^ Chudnov, Alexander M (1991). "Game-theoretical problems of synthesis of signal generation and reception algorithms (rus.)". Problems of Information Transmission. 27 (3): 57–65. ^ Anja Becker, Léo Ducas, Nicolas Gama, and Thijs Laarhoven. 2016. New directions in nearest neighbor searching with applications to lattice sieving. In Proceedings of the twenty-seventh annual ACM-SIAM symposium on Discrete algorithms (SODA '16), Robert Kraughgamer (Ed.). Society for Industrial and Applied Mathematics, Philadelphia, PA, USA, 10-24. Richmond, Timothy J. (1984). "Solvent accessible surface area and excluded volume in proteins: Analytical equation for overlapping spheres and implications for the hydrophobic effect". J. Mol. Biol. 178 (1): 63–89. doi:10.1016/0022-2836(84)90231-6. Lustig, Rolf (1986). "Geometry of four hard fused spheres in an arbitrary spatial configuration". Mol. Phys. 59 (2): 195–207. Bibcode:1986MolPh..59..195L. doi:10.1080/00268978600102011. Gibson, K. D.; Scheraga, Harold A. (1987). "Volume of the intersection of three spheres of unequal size: a simplified formula". J. Phys. Chem. 91 (15): 4121–4122. doi:10.1021/j100299a035. Gibson, K. D.; Scheraga, Harold A. (1987). "Exact calculation of the volume and surface area of fused hard-sphere molecules with unequal atomic radii". Mol. Phys. 62 (5): 1247–1265. Bibcode:1987MolPh..62.1247G. doi:10.1080/00268978700102951. Petitjean, Michel (1994). "On the analytical calculation of van der Waals surfaces and volumes: some numerical aspects". Int. J. Quantum Chem. 15 (5): 507–523. doi:10.1002/jcc.540150504. Grant, J. A.; Pickup, B. T. (1995). "A Gaussian description of molecular shape". J. Phys. Chem. 99 (11): 3503–3510. doi:10.1021/j100011a016. Busa, Jan; Dzurina, Jozef; Hayryan, Edik; Hayryan, Shura (2005). "ARVO: A fortran package for computing the solvent accessible surface area and the excluded volume of overlapping spheres via analytic equations". Comput. Phys. Commun. 165: 59–96. Bibcode:2005CoPhC.165...59B. doi:10.1016/j.cpc.2004.08.002. Wikimedia Commons has media related to Spherical caps. Weisstein, Eric W. "Spherical cap". MathWorld. Derivation and some additional formulas. Online calculator for spherical cap volume and area.